Relentless heat waves prevailing in the state has become a boon in disguise for coconut farmers as well as for small vendors in the present summer. Rajamahendravaram: Relentless heat waves prevailing in the state has become a boon in disguise for coconut farmers as well as for small vendors in the present summer. 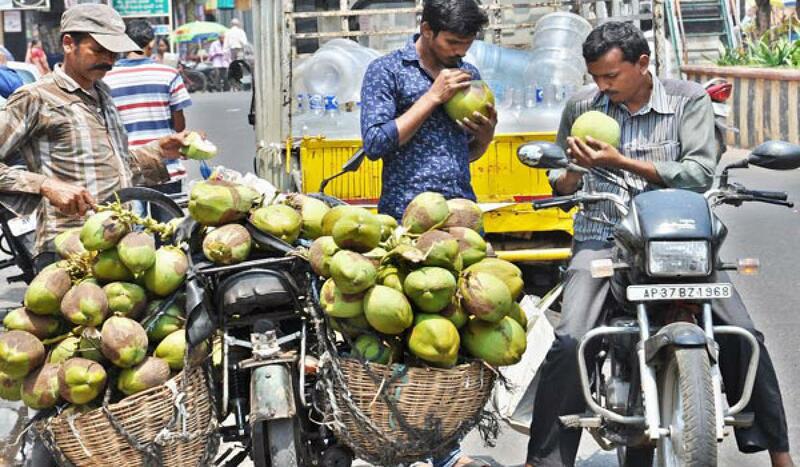 As the mercury is rising steeply, people are resorting to consuming tender coconut water to get relief from the scorching heat. Coconut farmers are now earning handsome money by selling tender coconuts in large scale. They are getting Rs 10,000 from Rs 12,000 per thousand coconuts. On the other side, small vendors who were selling seasonal fruits on two wheelers and carts are now busy in selling tender coconuts and earning Rs 500 from Rs 1,000 per day. As the consumption has increased rapidly due to the health consciousness among the people, the demand for tender coconuts has increased significantly.